Suppose an employee suffers from sleep apnea, which keeps employee awake for periods of time at night. In fact, the employee’s nighttime sleep patterns are interrupted to the point that the employee is excessively tired during the work day. Two weeks after being hired as a manager, the employee falls asleep during a meeting. When questioned, he mentions that he has sleep apnea, but blames the nap on the warmness of his room coupled with his jacket and tie. The employee would repeat his workplace naps numerous times over the next year, and when questioned he would merely state that he had a rough night. He never asked for an accommodation of his sleep apnea, nor indicated that sleep apnea was interfering with his job. This pattern continued for 18 months. 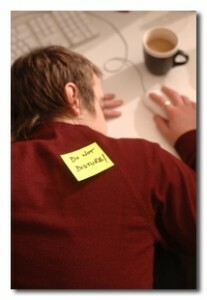 Finally, the employee’s supervisor catches him sleeping at his desk in the middle of the work day. When it took her more than five minutes to roust him, she told him that he could resign his employment or be terminated. The employee claims that he said that he had sleep apnea which causes him to involuntarily fall asleep, although he never requested any type of accommodation. In his resignation letter, he stated that he was disappointed that his employer was unable to accommodate his medical condition. Federal courts have recognized that the duty of an employer to make a reasonable accommodation also mandates that the employer interact with an employee in a good faith effort to seek a reasonable accommodation…. To show that an employer failed to participate in the interactive process, a disabled employee must demonstrate: 1) the employer knew about the employee’s disability; 2) the employee requested accommodations or assistance for his or her disability; 3) the employer did not make a good faith effort to assist the employee in seeking accommodations; and 4) the employee could have been reasonably accommodated but for the employer’s lack of good faith. As noted, Medlin never asked for reasonable accommodations to accommodate sleeping on the job before being given the option to resign or be terminated. At that time, Medlin did not even suggest what a reasonable accommodation might be; he simply stated in his resignation letter that he was disappointed that SMHA was unable to accommodate his medical condition. SMHA was entitled, however, to terminate Medlin’s employment the day before, when he was found asleep in violation of company rules. There is no showing that SMHA failed to act in good faith by giving Medlin the option the following day to resign or be fired for sleeping on the job, particularly when Medlin had never asked for an accommodation. This is not a situation in which an employee was ignorant of his condition. Medlin was aware for many years that he had sleep apnea, and had ample opportunity to bring the issue of accommodation to his employer’s attention. Medlin was twice questioned about sleeping on the job, and was specifically informed that he had been observed sleeping by other employees and by board commissioners. Nonetheless, Medlin failed to ask for a reasonable accommodation for his condition.